Early yesterday morning I caught my first whiff of Daphne odora. Just beginning to flower, the three shrubs are planted along the front of the house near the driveway. They have grown in together and appear to be one large Daphne. One of the three is D. ‘Aureomarginata’. The cold winter and heavy snows this year severely damaged the foliage and buds. From the street side they look terrible, but the portion that backs up to the porch was more protected and will make a nice, if limited, show. And the fragrance will certainly be enjoyed. 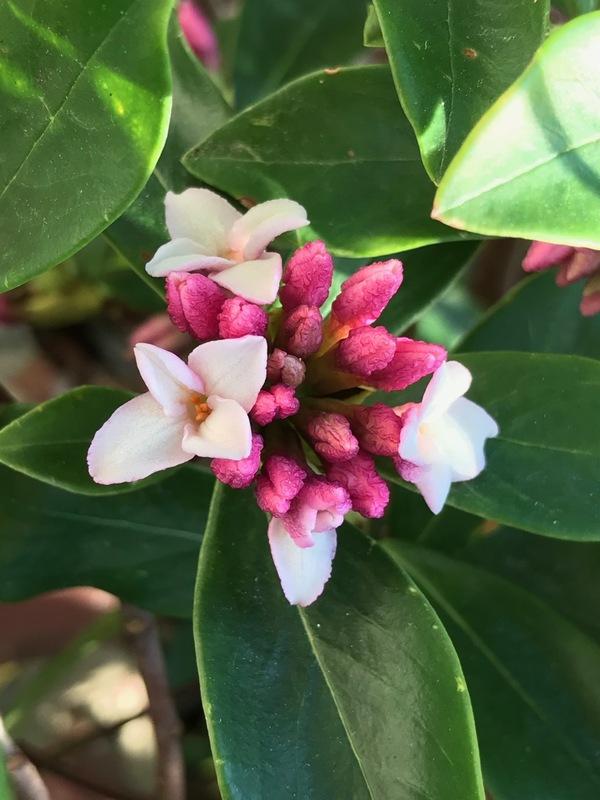 This entry was posted in garden and tagged Daphne odora (Winter daphne), winter garden on February 17, 2018 by pbmgarden. One of my favourite perfumes; lucky you to be enjoying it. After our heavy snow in January I was afraid none of the flowers would open. So catching the scent yesterday was a treat. Isn’t it a delicious scent Judy? By the way if you have a chance, check out Rivertown Bistro. Conway SC. I had lunch with my sister there last summer and it was very nice. That is such a pretty shrub. I haven’t seen one around here. It makes a nice shrub, stays attractive year round and forms those pink flower buds a good month or so before they open—pretty at that stage, but then the fragrance is the prize. We enjoyed this walking at Croome Park on Friday. It’s nice we gardeners are sharing similar experiences around the world. Hey, I just featured that not too long ago. Everyone seems to like it. I prefer yours though because it is not variegated. I’ll check out your daphne post Tony. I actually like the one that’s not variegated also. We grew only a few before we realized that no one wanted them. Daphne is expected to be variegated. We had another species with white flowers too, but it was also unpopular. Oh my gosh – what a temperature swing! With all this wild weather, I’m beginning to wonder if Mother Nature is going through menopause. We’re expecting a temperature swing too but nothing nearly as dramatic (15 degrees). I love the Daphnes, even if they’re battered and bruised. If we’d received any decent rain this year, I’d try growing one again. That is quite a rollercoaster of temperatures! Fragrant flowers are something my garden really doesn’t do well with. I’d add more but not everyone here enjoys strong fragrances on the wind. Oh gosh, I can almost pick up that scent from here. Your plants look very healthy, even if only from one side. They tend to get weedy and leggy here. At least, mine do! In general the daphnes have done well in this particular spot. They didn’t like our cold winter much. 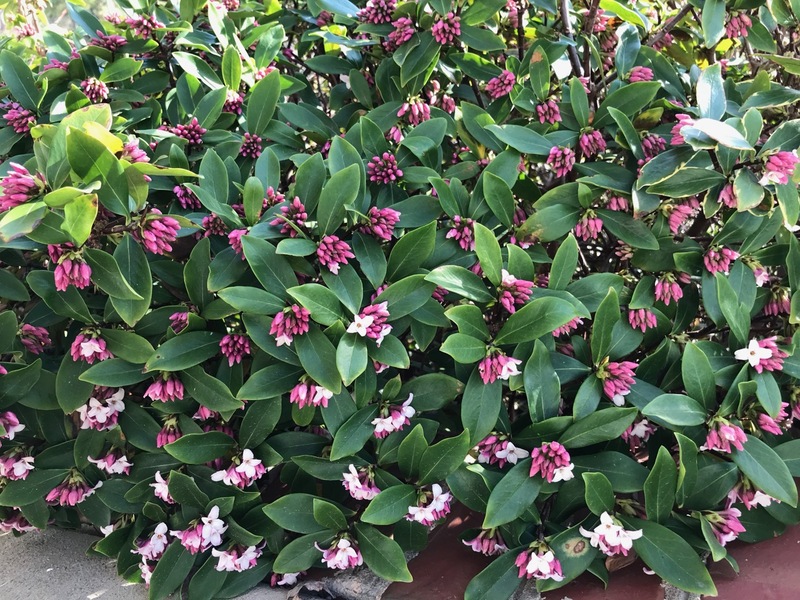 I would love to give that Daphne a sniff, so sad it is only hardy to zone 7.